For many years the secrets to making the best coffee were held closely by baristas and coffee aficionados, but with the internet, however, anyone can learn how to make a delicious cup of coffee. And one of the keys to delicious coffee is grinding the beans right before you brew them. Coffee beans don’t like to be exposed to the oxygen in air very much. When you leave them out in the air, they begin to undergo a chemical process known as oxidation. The thing about oxidation is that it causes the coffee to go stale and affects the coffee. With coffee beans, it’s not as serious because they are whole. With coffee grounds, it’s a whole other story. Coffee grounds have a much larger surface area exposed to the air than whole beans, so they oxidize faster. They also don’t have the protection afforded by a sheathe, which coffee beans enjoy. If you buy coffee grounds at your local store or supermarket, you’ll be getting coffee grounds that have been exposed to air multiple times during the grinding and packing process, therefore undergoing oxidation. You will also have to open that container when you get home, further exposing the grounds. The problem is you probably won’t use all of them at once, so every time you reopen the container, they’ll be exposed even further. When you decide to grind your beans at home, on the other hand, they will experience much less exposure to the air because they will be used almost immediately. You’ll also probably only grind as many beans as you’ll need for your coffee at the time. Grinding will take your time and patience, and you’ll need to do it right. It’s therefore important that you understand what type of grinder you’re working with and what its strengths and weaknesses are. That way, you can get the most out of it. Burr grinders work by having disks with teeth called burrs. The disks spin against each other to grind the coffee beans into small particles. Works by chopping your coffee beans up into small pieces with blades. So the decision is between blade grinders and burr grinders. Here there are a few other things to seriously consider. There are two major things you should think about when you’re grinding your coffee. These are the uniformity of the grounds and the heat they undergo during the grinding process. Heat isn’t something you want your coffee beans going through a lot because it ultimately damages your coffee beans and affects their flavor. The process of grinding coffee beans, however, is an inherently violent process. The amount of friction worked up during this process produces heat, especially for the faster grinders. Blade grinders are notorious for producing much more heat than burr grinders when grinding coffee beans. The blades undergo more friction and this leads to more heat, which damages the coffee beans. Burr grinders, on the other hand, not only undergo less friction, but also offer more control over the size of the granules and the speed of the burr grinder. With a burr grinder, a slower speed grinder can still produce uniform coffee grounds. With a blade grinder, a slower grinder naturally means even worse performance in terms of uniformity and that means your coffee grounds won’t be as good as you would like them. The second important thing to consider is uniformity. The reason why uniformity matters so much is that the brewing of coffee works in a specific way. Water has to be passed over the coffee grounds in order to get their flavor. The water will spend a specific amount of time in contact with the coffee grounds during the brewing process and they will impart flavor to it. In this case, the more uniform the coffee grounds are, the more efficient they will be at imparting flavor to it. Blade grinders are simply terrible at cutting up coffee beans into uniform grounds. The way the blades work, if the beans are different sizes, which they will most definitely be, you’re certainly going to get grounds with chunks in them. Burr grinders, on the other hand, produce an excellently uniform ground of coffee due to the special way they work. They therefore ensure you get a tastier coffee. Burr grinders are what the most professional coffee grinders use and they are preferably what you should use, especially if you’re going to be trying to make specific blends of coffee, like Turkish coffee. That’s not to say that a blade grinder won’t serve you well. It will still do an excellent job if used well. However, if you want more room to make different coffee blends and more control over the size of the granules in your coffee grounds, then a burr grinder is the way to go. Now that you know so much about the process of grinding coffee and coffee grinders, wouldn’t you like to know about some great coffee makers with grinders built in? The coffee makers on this list are pretty much the best of the best. You can choose whichever suits your needs best and get grinding and brewing immediately! This is the flagship Cuisinart grind-n-brew coffee maker. 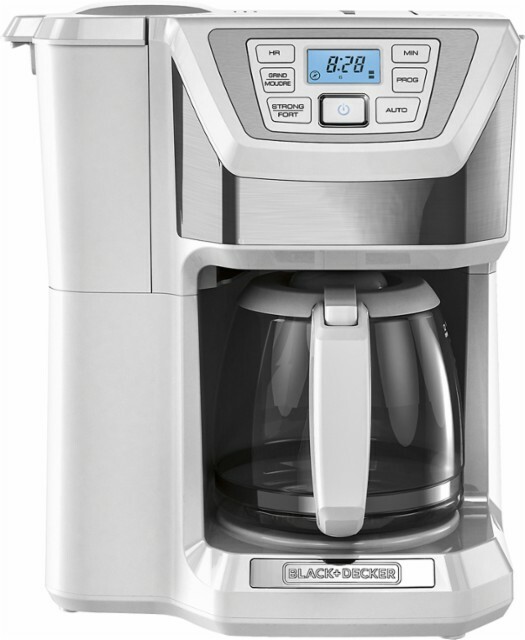 the DGB-900BC includes the features of it’s sister models as well as a thermal carafe. It is jam packed with features and looks good in just about any kitchen with any kind of interior décor. But you don’t have to take our word for it; let’s have a look at some of its greatest features one by one. 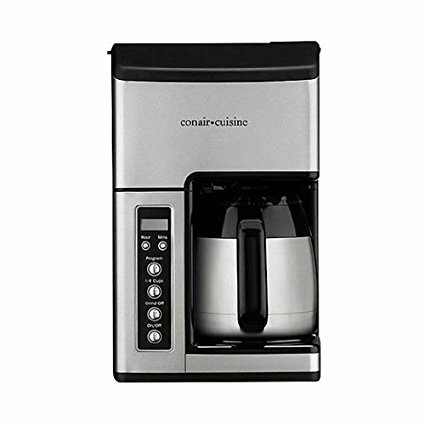 The good guys at Cuisinart understand that you won’t always want to make just your own coffee and get it over with. Sometimes, you have guests and you’d like them to have a taste of your famous home brewed coffee. Cuisinart have you sorted. This coffee maker can brew 12 cups of coffee at once. If that’s not convenient I don’t know what is. This one’s a major plus. We’ve belabored the point that burr grinders are the best grinders on the market to the point where it’s probably beginning to sound like some sort of anthem. Well, the truth is the point cannot be made enough; burr grinders are simply the best. The Cuisinart DGB-900BC features one for precisely that reason. The grinder on this coffee maker can easily grind up to 8 ounces of coffee at once, giving you enough coffee to fuel you throughout the day. This coffee maker features charcoal and gold filters that ensure your coffee always has whatever authentic signature flavor you want it to have. They basically soak up the residue oils from your previous grinds and brews to prevent them from mixing with your current brew. Without the residue, you can be sure you’re tasting nothing but the coffee you just brewed. What if you want a cup of coffee at specific times of the day? Sure you just brewed your morning coffee, but what if you want another cup at 4 and don’t want to have to brew another cup at that time? What if you want a cup of coffee made for you promptly at the top of the hour for each of the next 24 hours? If you don’t want to have to walk to and from the coffee maker constantly, then this is the coffee maker for you. It can be programmed to brew coffee with whatever frequency you want for the next 24 hours. Different people like their coffee at different levels of strength. Some like it mild and some want it so strong they can feel every sip on their tongue. Whatever works for you, the Cuisinart DGB-900BC Grind & Brew Thermal 12-Cup Automatic Coffeemaker can accommodate your tastes. High quality coffee maker for the price point. 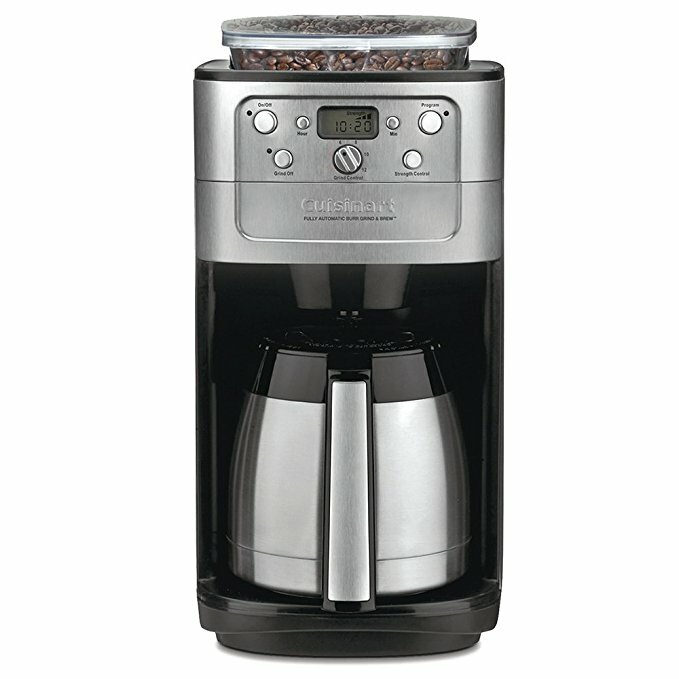 The Cuisinart DGB-900BC is an all-around winner because of it’s burr grinder and thermal carafe. 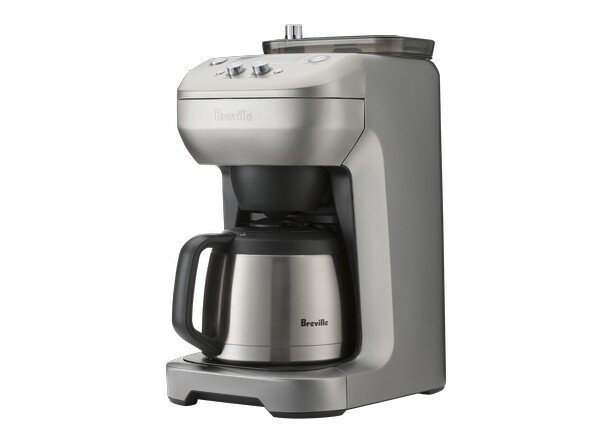 The good engineers at Breville have understood what it takes to make a good coffee maker for quite a while now. You can see with all Breville products that they don’t cut any corners. The BDC650BSS is no exception. It delivers some great features and design aspects that coffee enthusiasts great and small with appreciate. 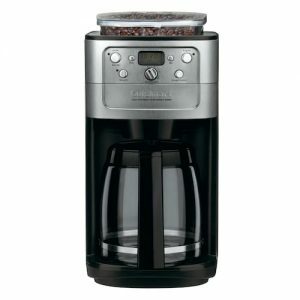 If you haven’t noticed already, all major coffee maker brands decide to incorporate burr grinders in their best models. This is another example of a good grinder made better by the addition of steel grinders. Stainless steel burrs are not only easy to clean, the ones on this coffee maker also happen to deliver the perfect granule size for drip filter brewing. You can even adjust the grind size to accommodate different types of coffee. In case you don’t want to fiddle about with it too much, the number 3 setting is perfect for most coffee varieties out there. In case you don’t want to grind your own coffee, you can easily disable the grinder and use the coffee maker alone. This coffee maker doesn’t disappoint with its ability to offer 8 cups at a go. With the carafe mode, you can choose to brew any size of coffee from the 2 cup minimum all the way to the 12 cup maximum. If you go for a single cup, you can even choose from 7 different size options that account for varying amounts of milk! This feature allows you to program the coffee maker to automatically start grinding and brewing coffee for you. Do you want your coffee promptly when you wake up tomorrow morning? No problem! You can tell you coffee maker to have your coffee ready and get up to go take it at the appropriate time. Not 2, 3, or 4 strength settings; this beast has 8 strength settings! They’re phrased as coffee to water ratios but it’s basically the same thing. You can choose how strong you want your coffee to be and have it just so. Breville is a solid name in kitchen appliances so you’re paying for quality. Great option if price is not a consideration. This coffee maker is supposed to be the bargain of the century as it is the cheapest option on this list. It certainly works hard to deliver, considering the price, but there are things you will have to live with that not everyone will be able to tolerate. Perhaps the biggest of these negatives is the loudness of the grinder. The DGB-550BK features a blade grinder that is somewhat louder than the competition. There aren’t too many features packed into this coffee maker, but the few that are important enough to make it a worthwhile purchase. This coffee maker is programmable, so you can have your coffee when you want it without having to go through the hassle of making it yourself. The carafe is made of glass, which isn’t the most thermally efficient material out there. However, it should keep your coffee warm long enough. On the flip side, the carafe can hold up to 12 cups of coffee so at least you know you’re sorted if you have guests over and they all need coffee. If you’re not looking to make 12 cups of coffee, there’s a separate 1-4 cup functionality that allows you to make coffee for a lesser number of people. You can brew it for yourself and a couple of other people with ease. The brew pause feature also allows you to enjoy a cup of coffee right in the middle of coffee. The grinder isn’t exactly industry standard, and it can be a bit of a pain to clean, but it makes good enough coffee. You can also disable it altogether with the grind-off feature and enjoy your pre-ground coffee. This happens to be Cuisinart’s next-best offering to their flagship 900BC coffee maker. 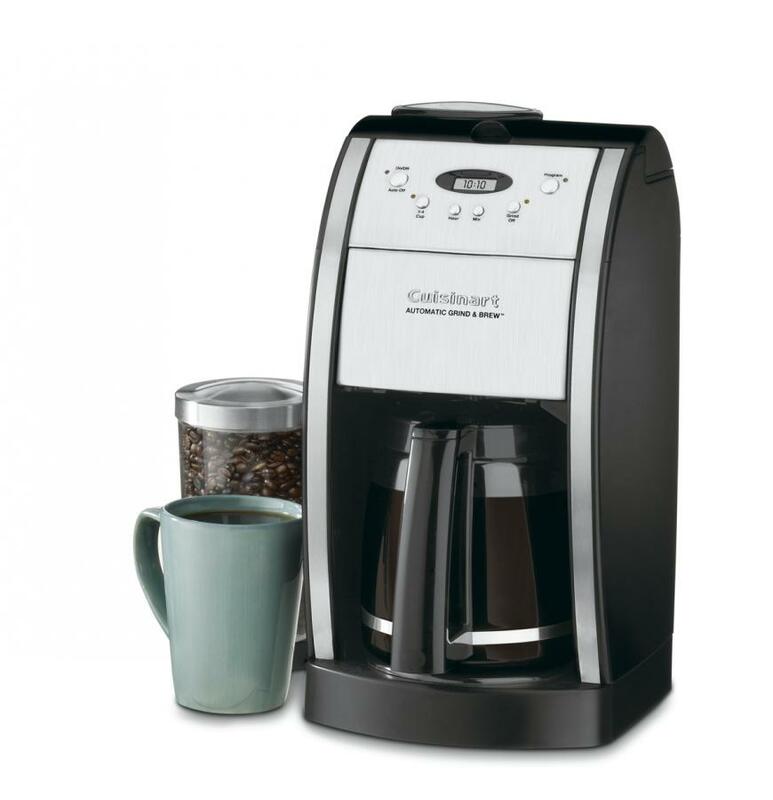 It has all the features of the other Cuisinart coffee makers plus a warming plate to keep coffee warm for hours. If you like it for nothing else, you’ll certainly love the aesthetic design it has. It looks good in just about any kitchen. This is something you can expect from a top notch coffee maker. You can program it to make you and your friends some coffee with whatever frequency you want over the next 24 hours. Whether you’re looking to come home to a hot brew after 10 hours of work or simply want coffee regularly to keep you on your feet, you don’t have to go through the trouble of making it yourself. This Cuisinart appliance allows you to brew a mean amount of coffee for you, your partner, your friends, their friends, and probably still have some to spare. The idea here is that you can make enough coffee that no one feels left out. The carafe also keeps it warm enough that you can come back and have another cup at just the same temperature as when you brewed it. The grinder on this Cuisinart can grind up to 8 ounces of beans, meaning you get enough coffee grounds to last you for the whole day. Or enough for you and your friends to all have coffee. However you want to look at it is just fine! This burr grinder is top of the line with some great functionality. You can fine tune how fine you want your coffee grounds to be for different types of coffee. You can also disable the grinder if you prefer pre-ground coffee. This model has a warming plate so you don’t need to worry about the pot going cold. The Cuisinart DGB-700BC s a good choice of you don’t care about a thermal carafe. KRUPS are a force to reckon with in the coffee maker market. They’re pretty unassuming and their products achieve what they’re supposed to with a certain flair you won’t easily find anywhere else. The KM785D50 is one of their better offerings and has some great features that you’re bound to love. 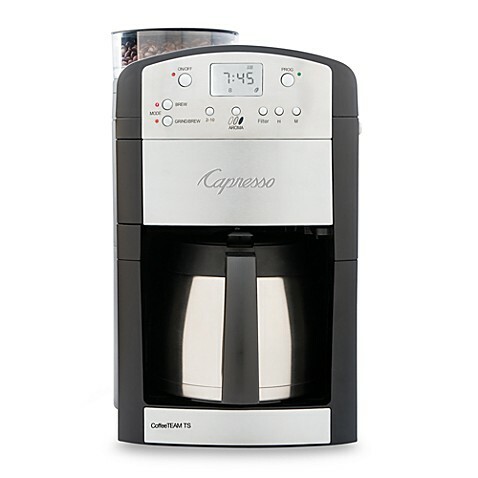 The KM785D50 uses the Drip Filter method to make your coffee. This method makes for some pretty delicious coffee so you can be sure whatever you’ll be getting out of this coffee maker will be sure to tantalize your taste buds. It’s not the same 12 cups being offered by other coffee makers on this list. However, it’s still good enough. This coffee maker can make you up to 10 cups of great coffee at a go, allowing your friends to enjoy the same great coffee that you enjoy yourself. It also has a 2-10 cup selector if you would like a little less. Keeping up the tradition of using burr grinders for best results, the good guys at KRUPS fitted this model with not just a burr grinder but a conical one. Conical burr grinders are the best and they also happen to be the least noisy. It also has 5 settings which allow you to choose just how fine you want your coffee grounds to be. The strength selector allows you to choose from 3 settings: mild, medium, and strong. It’s not as detailed as some other coffee makers, but it certainly gets the job done. This coffee maker allows you to tell it when to brew your coffee with the auto start function. You don’t have to physically go to it and brew your own coffee every time you want a cup, which we feel is pretty much a mandatory feature of any great coffee maker. 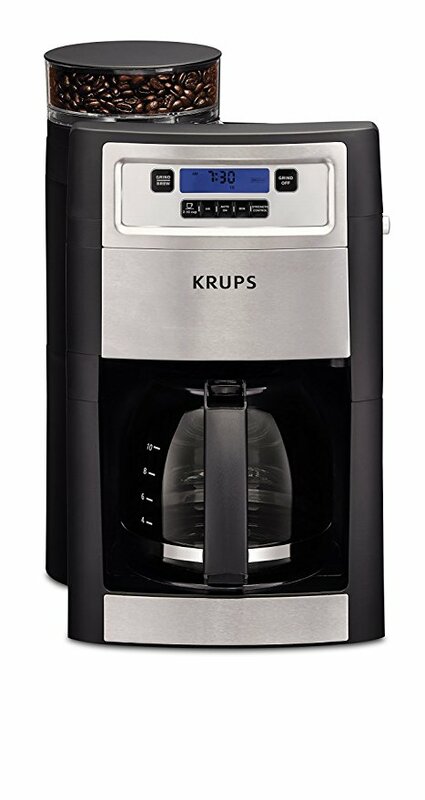 The KRUPS has a keep warm feature that keeps your coffee warm for up to 2 hours, allowing you to brew a lot of coffee at once and enjoy it little by little as you work. Probably more expensive than it should be, but a quality build because of the Krups name. When it comes to grinding and brewing your coffee while still looking stylish and fashionable, the Capresso does not disappoint. This device has the quintessential Capresso charm about it. It certainly has a penchant for brewing some of the most delicious and flavorful coffee you’ll ever taste. Again, this is something you should expect all great coffee makers to have. The Capresso 465 Coffee Team TS isn’t about to let you brew your own coffee. You can set it and go mind your own business. At the preordained time you will come back and find a hot cup of coffee waiting for you. This coffee maker certainly isn’t cutting any corners when it comes to making you coffee you’ll enjoy. You can determine almost practically anything about your coffee with this machine. You get to use different flavor settings as well as strength settings. If you’re a dark roast coffee, then this is the machine that was made especially for you. Longevity and quality is something the Capresso people are well known for. Their products will serve you for many a year before they throw in the towel. The 465 Coffee Team TS is no exception. It’s made of some high quality materials that guarantee an optimal performance all-round. The burr grinder on this machine is certainly noisy, but it’s worth it. You get to choose from 5 different settings for just how fine your coffee grounds will be. No matter what kind of coffee you enjoy, the 465 Coffee Team TS has you sorted. Premium grind n brew coffeemaker with intuitive controls. A good selection for those that prefer the best. This is one of the cheaper Cuisinart and it works to achieve the bare minimum as far as functionality is concerned. Still, it does a pretty good job and delivers what a decent coffee maker is expected to deliver. The carafe on this coffee maker may not have a heating element to keep the coffee hot after you brew it, but it certainly gets the job done in its own way. It is a double walled thermal carafe that is guaranteed to keep your coffee warm for at least an hour after brewing. Despite its humble price, the CC-10FR is programmable, allowing you to preset the machine’s coffee brewing function for up to 24 hours into the future. This is a great feature to add to this coffee maker because it certainly gives it a lot more punch. It’s definitely not a burr grinder but it does the job just fine. You can still set the fineness level to a point, allowing you to enjoy different types of coffee. If, on the other hand, you prefer pre-ground coffee, you can easily disable the grinder and use the brewer alone. The finish is stainless steel, making the coffee maker both durable and aesthetically pleasing. You don’t have to worry too much about it getting damaged and you’ll be happy putting this coffee maker anywhere in your kitchen because it goes well with any kind of décor. Most people have one gripe with most coffee makers. They are extremely heavy and the handles just aren’t made with ergonomic considerations in mind. They either don’t have enough grip or are poorly designed, leading to messy counter tops whenever coffee is being served. The handle on this coffee maker solves that problem by having both a strong grip and a great ergonomic design. Carrying this machine should be a breeze. Excellent coffeemaker at a cheaper price point for those who don’t mind having a blade grinder. Black & Decker are known for making quality appliances and the CM5000WD is an excellent example of their pedigree. This coffee maker is a serious appliance that gets the job done without cutting any corners. It has all the essentials of a great coffee maker and a stylish look that’s bound to appeal to your tastes. This coffee maker features a powerful conical burr grinder. It grinds your coffee into a medium fine texture and allows you to make some great coffee with it. One setback is that it doesn’t have settings for you to choose just how fine or coarse your coffee should be. This may be a disappointment for those looking to try many different varieties of coffee. The grinder, however, certainly makes good coffee and anyone will enjoy it. It’s also very easy to clean with separately removable parts that you can disassemble and reassemble after use. If you prefer pre-ground coffee, simply disable the grinder. The Quick Touch programming feature allows you to preset your coffee maker to brew up to 24 hours into the future with as high a frequency as you wish. You can choose how strong you want your brew to be with the brew strength selector. You can have it mild, medium or strong and enjoy your cup of coffee just the way you and your buddies like it. Great choice with excellent features for the budget-conscious coffee lover. The good people at Gourmia say their mission is to make everyday cooking easy, healthy and delicious. This is a bold claim but they back it up by delivering great products that do the job just fine. They’re a great option to end this list because their coffee maker with a grinder built in is as no frills functional as it gets. The GCM4700 has a conical burr grinder built in that gets the job done. It grinds your coffee beans into a fine powder that imparts nothing but great flavor to your coffee. The grinder will easily work with most varieties of coffee beans. It can also be disabled if you prefer pre-ground coffee. 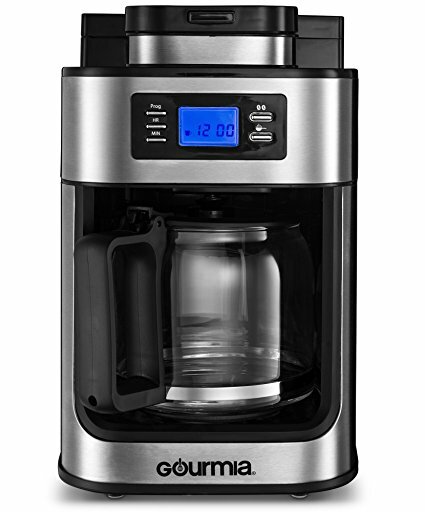 The Gourmia GCM4700 has a program button that enables you to preset the coffee maker’s brewing function many hours in advance and go about your business in the interim. You can go on with your work and find your coffee ready in a few hours or go to sleep and find your coffee ready in the morning. The Carafe is designed to keep your coffee piping hot for up to 30 minutes after a brew, allowing you to make plenty of it in advance and enjoy it in bits over time. If you have friends over, you can make up to 10 cups with the Gourmia, allowing you and your friends to all enjoy some great coffee as you do your thing. Stylish and compact and easily cleanable. Can’t go wrong with at this price point. The coffee makers on this list are some of the best you’ll get out there that will give you a definite bang for your buck. They are functional, affordable, and certainly aesthetically pleasing, ensuring they’ll look good in just about any kitchen. Don’t forget to grind responsibly and follow some of the tips in the article to get the best out of your coffee grinder. Otherwise, enjoy your coffee!